I bought the Stampers Anonymous Mini Halloween 3 stamp set a couple weeks ago for a project I was thinking about and then found myself working on other things through out the month. Lucky for me, a friend called and asked for some help making a few Halloween things...I said, I have just what we need! So the lollapolooza started on Saturday night making simple tags for plates of Halloween goodies being left on doorsteps. Dusty Concord and Crushed Grape Distress Ink made for a great background. I taught her how to do the spritz and flick technique which added to the Halloween feel. 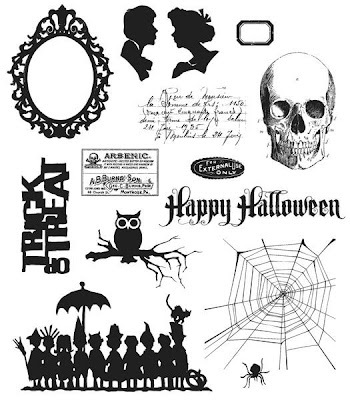 We stamped favorite images from the Mini Halloween 3 set, then added the word "boo" cut from the Wordplay die. NOTE: We glittered the letters using sticky embossing powder and Stickles Dry Fine Glitter. Can't say enough good stuff about the way the glitter sticks to the embossing powder. If you missed the post about it you can read it here. 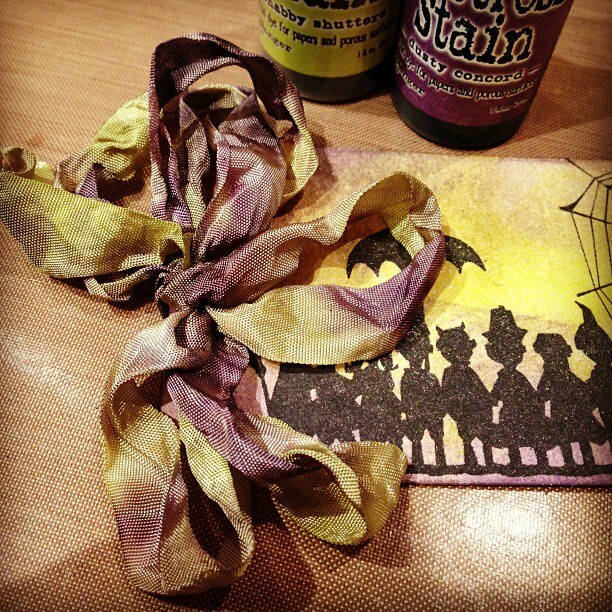 We also made Crinkle ribbon in Halloween colors using Shabby Shutters and Dusty Concord Distress Stain. Great Halloween combination. Move on to Sunday...still wanting to do more with that stamp. I stamped multiple images of the skull on glossy paper then heat embossed it with black embossing powder and cut them out. 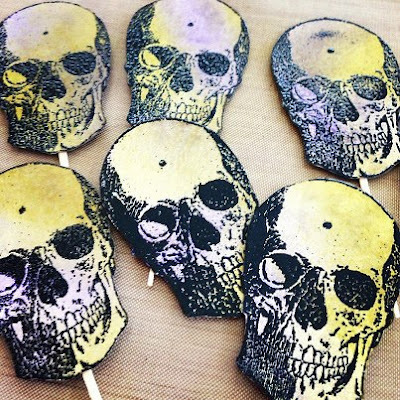 Inked each skull with Dusty Concord and Crushed Olive Distress Ink. Just add Dusty Concord over the entire back. I added a toothpick with a Glossy Accents to each one. Just give them a few minutes to dry, then ink just the part glued to the skull so the toothpick will blend in. 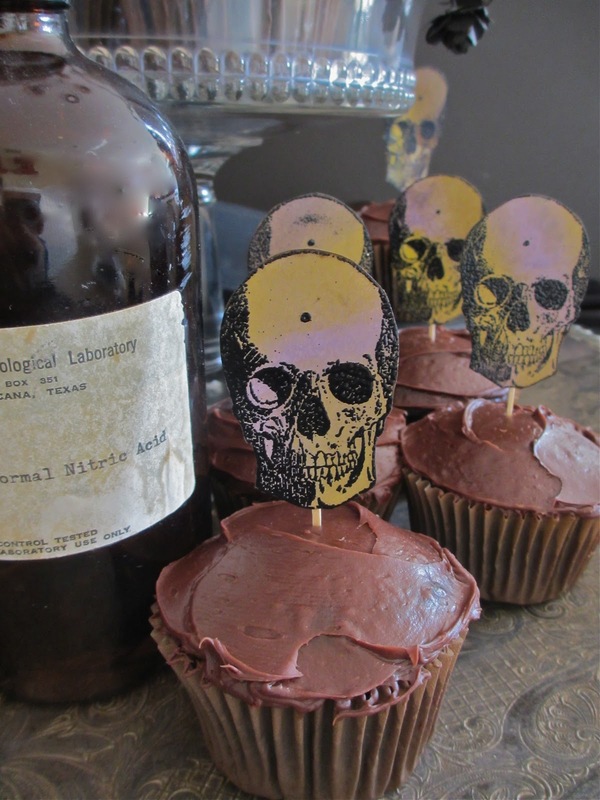 I stamped each of them with the spiderweb and spider using black Archival ink. Love how that turned out. Add to some frosted cupcakes. A fun dessert for the kids after dinner on Sunday night. 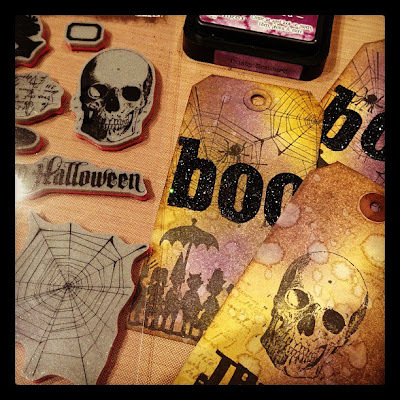 And now Monday...one more project using the Mini Halloween Stamp. I needed to wrap one Halloween gift. I found this polka dot gift box in the closet. It had a slick surface like glossy paper so I decided to use Alcohol ink the color the dots. First Purple Twilight. Then Lettuce (kind looks like a microscope slide at this point). I added a few spiders with black Archival Ink. I cut out a mask from scrap paper and added webs. Some webs covered the entire circle. Love how it turned out...I really wanted to make more boxes! The box needed a tag so I made a big one using Glossy paper and Alcohol Ink. 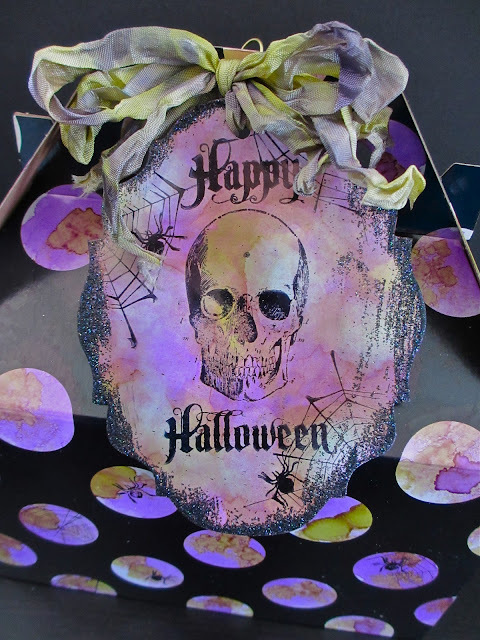 The shape was created using the Sizzix Alterations Baroque die edged in the black Stickles Glitter (and a bit of Crinkle ribbon left from the Saturday night soiree). cheers for a great one! Your friend had a lucky day making these fun projects with you! That spider web really gave the skulls and tags a Halloween look. Love the ribbons, too. I just love Halloween and this time of year! Your gift box looks so great and love how it turned out!! I have that same stamp set and I love it! I'm really loving what you did with it, thank you for sharing it with us. A smorgasbord of goodness here! WOW! What fun!!! Children will squeal in delight! Love all these goodies. This stamp set is so versatile. Thanks for sharing. WOW!! SO many awesome projects!!!! Very cool projects, Paula. Love that spider web!! Awesome! It was just like a play date....thanks for the inspiration and tutorials. Happy Halloween. Fantastic Halloween projects! Great job, thank you for sharing. Great Halloween projects! I love the box!